The One-Stop-Shop allows customer service agents to sell any and all products from one simple to use interface. Customer profiles allow for easy and consistent management of all family members on one account. All products sold are consolidated and printed on one receipt. The One-Stop-Shop interface enables resorts to save time when serving customers and provide a more positive experience for customers who can purchase all products in one place. The Ski School module provides a sophisticated interface for managing ski school products, students and ski instructors. The software supports all ski school products including season programs, school groups, and private lessons. Ski School managers can set the types of groups and courses they want to create for every product sold. Fully customizable software to allow the resort to develop and manage unique products and reports as needed. The software enables automatic matching of available and qualified instructors to lessons. The Check-in module allows instructors to scan their employee pass to notify supervisors that they are available and to show their upcoming schedule. The software has built in functionality to email or SMS instructors when lessons are booked. 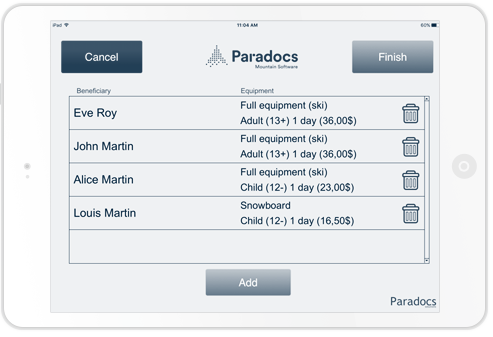 The Paradocs iPad interface allows supervisors to assign instructors on the snow. The lift ticket module is completely integrated into the overall system. Products that include ticket sales will allow for quick and easy printing of lift tickets. Customer service agents will save time in serving each client by being able to use one system for all components of a given transaction. The Access module supports the sale of daily tickets and seasons passes. Season pass acts as a Resort Card allowing resort customers to purchase products across the resort. The Resort Card is managed by family so limits can be set for each family member. Discounts can be automatically applied and integrated into the Resort Card. The Access module supports custom layouts and can be integrated with all printers. The software provides enhanced usage statistics leading to operational optimizations. The rental system enables improved customer experience and operational efficiency through the use of tablet devices. The seamless interface supports high volume and individual rentals. Customer information can be obtained by scanning Drivers License to save time. The digital interface allows for more effective and efficient tracking of equipment. All products are tracked to the customer profile within the system reducing the need for paper records and ensuring that information can be easily searched and retrieved when needed. The integrated interface stores the necessary customer information to allow the rental department to ready the equipment in advance of the customer arriving at the rental shop. This allows staff to match equipment to customers more quickly and efficiently. The Food & Beverage system has an intuitive Point Of Sale interface. The software can be deployed on any hardware or touch screen. The Food & Beverage module supports quick sales, Resort Card sales and detailed invoicing. The software supports MEV in the restaurant and bar as required by Revenue Quebec. 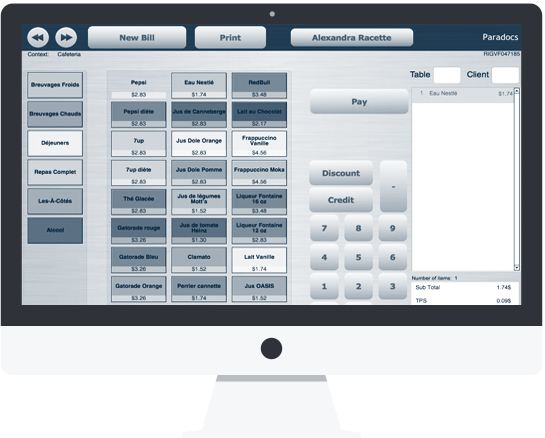 The Retail software module functions as an integrated Point Of Sale (POS) system with a touchscreen or as a full-fledged interface that details customer information and the products being sold. 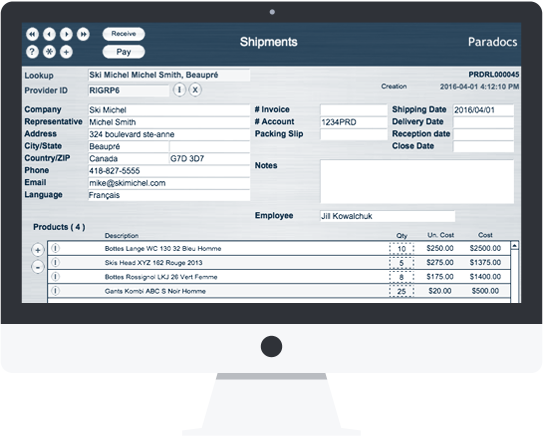 The software tracks inventory, generates purchase orders, and manages shipments. An iPod interface is available for quick and simple inventory intake and sales. The Retail system enables stores to sell and track special orders quickly and easily. 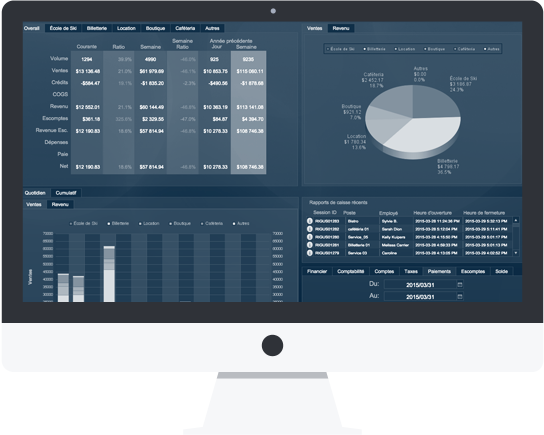 Products, sales and credits are captured in one integrated system. Provides the necessary reporting to ensure that sales by each department are tracked and accounted for accurately. Revenue is tracked against expenses daily. The system provides for comprehensive accounts payable tracking. The Paradocs RMS allows for the significant reduction in the time required to manage the daily facility operations. Weekly and annual revenue is tracked and reported against previous year.